Home Entertainment Celebrity News Are XXXTentacion’s killers out for Tekashi69 too? Are XXXTentacion’s killers out for Tekashi69 too? The killing of XXXTentacion some weeks ago was a painful moment that fans had to endure and so the thought of going through such again with anaother young star like Tekashi69 is almost depressing. The individuals suspected of enacting X’s murder were indicted this month but this matter now seems far from over after Tekashi’s life was also threatened yesterday. The world woke up to a shocking tale of how the young rapper was kidnapped, gun whipped and robbed on Sunday morning. Tekashi69 was heading home on Sunday morning at around 4 am after working on a music video in Brooklyn. When he arrived, someone pulled up on a vehicle and blocked his driveway. 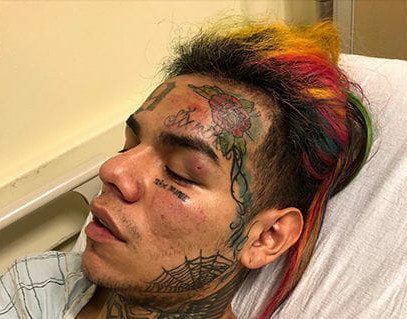 Three hooded gunmen then grabbed Tekashi and pistol whipped him and he lost consciousness. When he woke up, he was in the backseat of the car and the guys were driving around. They then threatened to kill him if he did not give the money and jewelry. READ ALSO: WHAT NEXT FOR AFRICAN MIGRANTS AFTER FRANCE WIN THE WORLD CUP? The men returned to his residence where two men got into the house and looted jewelry and cash. They took about $750K worth of jewelry and about $15K to $20K in cash. They then drove away with him but at some point he managed to open the back door and jumped on to the road. One of the guys tried to follow him but retreated in fear of being ID’d. so the world is left wondering, is there a plot against these young rising Hip hop star? And could X have just been one in many to come? Guess Who The New Empire Guest Stars Are!